Once you have made your consecration, it is rec­ommended that you join the Confraternity of Mary, Queen of All Hearts. Nature and purpose of the Confraternity. How to join the Confraternity. a. 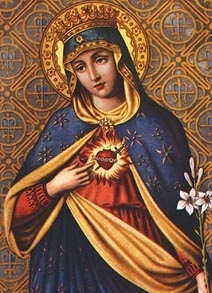 Any Catholic, including clerics and religious, may become a member of the Confraternity of Mary, Queen of All Hearts … the members may assume other obligations special to their spiritual life or their apostolate. b. Prior to their enrollment, the applicants must consecrate themselves to the Blessed Virgin, using for this purpose the consecra­tion of St. Louis Marie De Montfort." (Rescript, July 16, 1955). In keeping with the purpose of the Confraternity, the members should enrich their lives with a Marian spirit – doing all things with Mary, through Mary, in Mary, and for Mary. By this means, they will more perfectly live and act with, through, in, and for Christ. They should renew their consecration faithfully and frequently, making a special practice of renew­ing it every morning at the beginning of each new day. The members share in all the good works and prayers of the members of the Company of Mary and the Daughters of Wisdom. Feasts of the Confraternity The Annunciation (March 25) is the principal feast of the Confraternity. On this feast, there is recalled to our minds the great truth of Our Divine Lord's Incarnation and that He came to us through Mary and willed to submit Himself to her, His Holy Mother. The feast of Saint Louis De Montfort (April 28) is the second principal feast of the Confraternity. Other special feasts of the Confraternity are: the Immaculate Conception (December 8), Christmas (December 25), the Purification (February 2), the Visitation (May 31), the Assumption (August 15), the Immaculate Heart of Mary, the feast of our Lady of Sorrows (September 15). On the occasion of the initial consecration (using the De Montfort formula) or, on the occasion of its renewal, a PLENARY INDULGENCE is granted, under the usual conditions (Confession, Com­munion and prayer for the intentions of the Holy Father). Also, a PLENARY INDULGENCE on the following days: 1 – The day of enrollment in the Confraternity; 2 – Holy Thursday; 3 – Christmas; 4 ­Feast of the Annunciation; 5 – Feast of the Immaculate Conception; (Dec. 8); 6 – St. Louis De Montfort's Feast day (April 28); 7 – Every First Saturday of the Month. Members of the Confraternity also share in the sat­isfaction, prayers and good works of the Mission­aries of the Company of Mary (the Montfort Fathers and Brothers), the Daughters of Wisdom, and the Brothers of St. Gabriel, the three congregations founded by St. Louis De Montfort. In answer to a petition by the Montfort Missionaries to the Sacred Penitentiary in Rome, the above Indulgences have now been granted in perpetuity to the two Confra­ternities (Priests of Mary, Queen of All Hearts and the Confraternity of Mary, Queen of All Hearts), thus bringing them in line with the conditions laid down by the new Enchiridion of Indulgences.